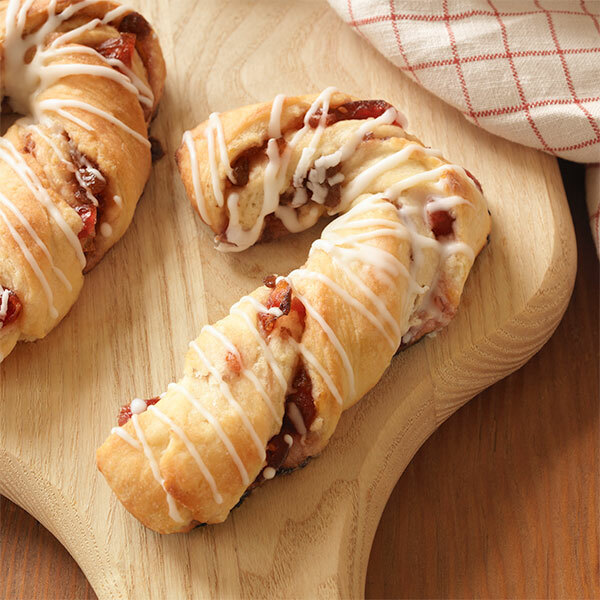 This sweet twist on cranberry bread is the perfect breakfast pastry to wake up to on Christmas morning. Flaky dough, an orange-cranberry filling and a simple drizzle of powdered-sugar glaze will make this a Christmas breakfast to remember. When my husband and I celebrated our first holiday season together, he brought me Hanukkah—potato latkes and eight nights of candles commemorating a miracle. I brought him my family’s Cranberry Christmas Canes and the miracle that is Christmas. Families celebrate all kinds of traditions, but if there’s one thing we share, it’s the foods that recall our wonderful times together: edible heirlooms treasured through generations because the tastes and smells evoke such loving memories. Cranberry Christmas Canes have been part of my life for as long as I can remember. Sometime early on a Saturday morning in December, the unmistakable smell would waft from the kitchen; my father was mixing the sweet, yeasty dough. A bit later, my mother would be hovering over the cranberry sauce. Then, in the afternoon (once my three siblings and I were old enough to participate), the family assembly line would put together dozens of the treats and package them for delivery to friends and neighbors. I’ve kept up the tradition; in fact, I can’t imagine Christmas without it. Now, as I watch my own children folding dough and frosting canes, I know that the smells and tastes will one day also remind them of cozy December days. Happy holidays to you and yours, and here’s wishing us all a season of wonderful memories in the making. In a small saucepan, combine the cranberries and all other filling ingredients. Cook over medium heat until the berries are soft. Refrigerate. In a food processor, combine flour, sugar, lemon zest, salt and butter. Stir in milk, yeast mixture and eggs to form a very soft dough. Preheat the oven to 400°F. Line a baking sheet with a nonstick liner or foil. Divide dough in half (refrigerate second half). Roll into a 15 by 18 inch rectangle. Starting from a short side, spread half of the cranberry sauce over two-thirds of the rectangle. Pick up the third with no sauce on it and fold halfway over the sauced dough. Fold that over the last third and pinch the edges. Trim the ends, and then cut crosswise into 12 strips. Twist each strip a couple of times, and then place on the baking sheet and bend one end over to resemble a candy cane. Bake for 10 to 15 minutes, until lightly browned. Transfer to a rack to cool. Repeat with remaining dough and filling. In a small bowl, with an electric mixer, beat the butter and sugar together. Use a pasty bag with a small tip to frost cooled pastries.